With the weather continuing to ruin our outdoor plans, we’re pressing pause on alfresco brunching. And with more days of unstable weather ahead, this Friday you’ll find us firmly indoors. But, that won’t rain (or dust) on our parade totally. 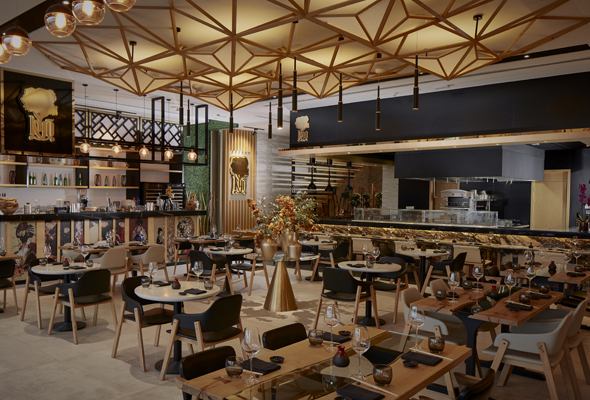 It’s the perfect reason to check out one of Dubai’s brilliant new indoor brunches, and we’ve got plenty for you to choose from. We Brunch by Love Parties might not be new, but when one of the city’s most popular party brunches turns two, it’s worth a mention. Having undergone a bit of a makeover, it’s now bigger and better than ever with upgraded food and live cooking stations, a glitter bar, donut wall and bathtub filled with bottles. 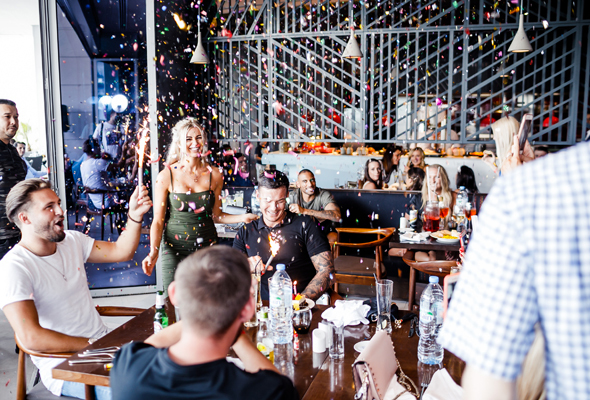 The Love Parties team are on hand to make sure each table has a memorable afternoon, while the DJ spins hit after hit sure to get you on the dance floor come 4.30pm. This is one brunch party people won’t want to miss. Formerly found at Golden Mile Galleria Mall, Kyo has moved to The Pointe and serves up a Japanese-themed brunch every Friday. The Japanese Journey is a four-hour ‘journey’ through Japanese cuisine which begins in Osaka, which is famous for having the best ramen in Japan. Here, guests will experience the famous Yasai Ramen, Aka Miso and Wagyu Beef Gyoza. Next, guests are treated to a series of fresh salads inspired by Fukushima, a region popular for fresh vegetables, harvested daily. Moving on to the third stop, and the ‘hometown of creativity’, Tokyo – KYO will be serving an array of sushi such as Salmon Sashimi, Truffle Sea Bass Nigiri, Spicy Tuna Uramaki and Avocado and Hosomaki Eel Maki. The fourth stop takes you to Sapporo, where guests can enjoy authentic grill dishes before the fifth and final stop, Kumamoto, where diners are encouraged to journey to the dessert table for a sweet treat. 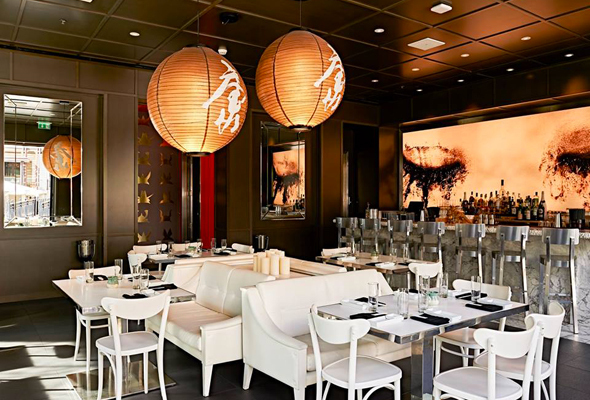 While this restaurant does boast a stunning outdoor terrace looking out to the Jumeirah Al Naseem waterways, it’s just as pretty inside, where oversized Japanese lanterns drape throughout and bold artworks adorn the walls. At the ‘Big Brunch’, you’ll have more than 100 contemporary Japanese dishes to choose from, all served up to free-flowing beverages for four hours from noon to 4pm. Already established as a leading destination for modern Cantonese cuisine in the city, Brunch at Hakkasan, features signature favourites every Friday with free flowing drinks from Dhs328. 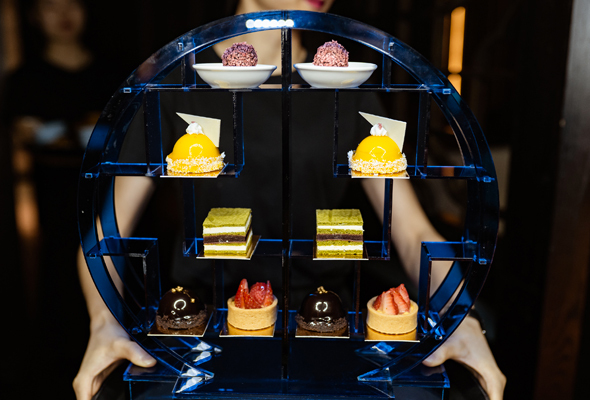 It kicks off with a welcome cocktail, followed by dim sum dishes designed to share, then the Hakkasan signature Peking duck as well as the celebrated crispy duck salad and stir-fried vegetable and pine-nut lettuce wraps. Guests can then choose one main course from the brunch menu, which features a number of house favourites including the wok-fried beef rib eye with chilli and cashew nuts, the black cod with XO sauce or the wok-seared tiger prawns served with lemongrass and chilli. The dining experience will end with the chef’s selection of desserts. The south-American inspired Toro Toro has launched a new Friday brunch which kicks off at the civilised time of 3pm. Guests can enjoy three hours of unlimited starters, mains and desserts accompanied by a free flowing of beverages from 3pm to 6pm, with a happy hour taking over from 6pm offering selected drinks for Dhs30. On the menu, expect smoked guac, tuna tataki and wild mushroom flatbread, followed by Argentinean steaks and chaufa rice with chicken. 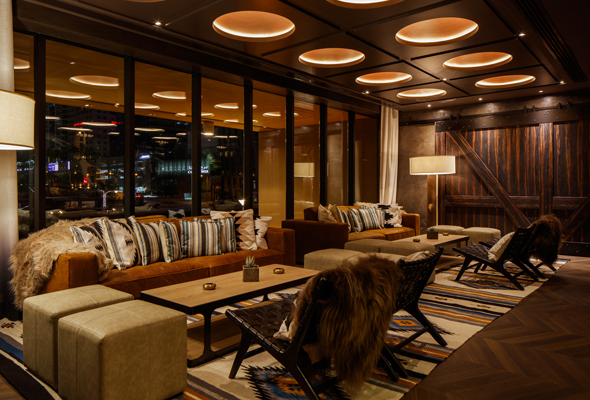 It’s washed down with beverages from the three dedicated drinks stations where you can mix your own Sangria, infuse spirit-based beverages with spices and syrups and enjoy the signature Caipirinha to the backdrop of Toro Toro’s DJ Pedro. The Late Party Brunch at Skyland offers fresh sushi, spreads of varied cheeses, unlimited gourmet bites and free-flow bubbly and cocktails. 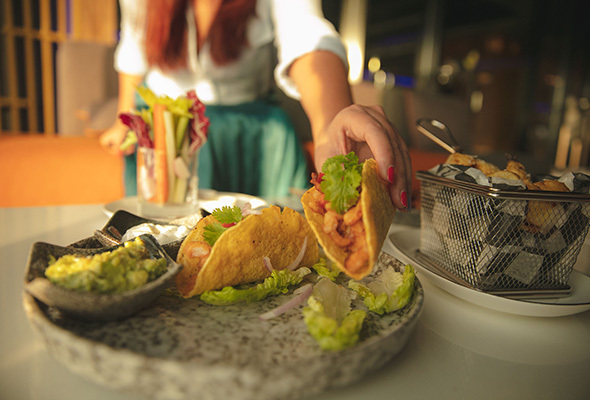 Running from 7pm to 11pm, this brunch offers panoramic views of Dubai Marina and JBR skyline by night.